I looked off the balcony just now to see what the noise was and noticed the O show obviously has started taping the new season. These are all the happy audience members grabbing cabs after the show. 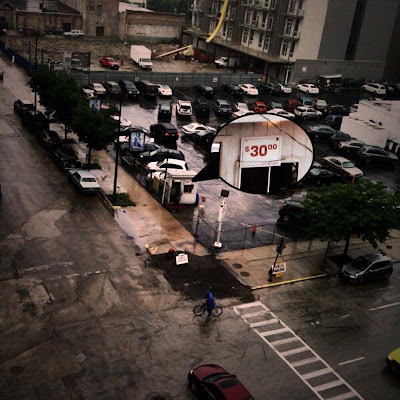 You can see by the price on the parking lot sign across the street why many take cabs. The price changes from $15 as a normal rate to $30 during the show. BTW, this lot is not owned by Harpo. 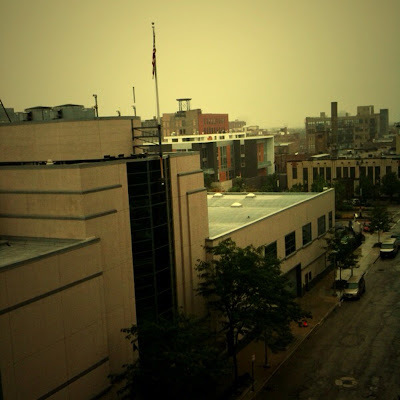 I am playing with a new iphone app- Toy Camera that Judy Wise posted about on her blog. Thanks Judy! The app has a fun setting that changes filters with each photo so it is always a surprise to see what the photo will look like. I love the way this photo with Harpo studios in the foreground looks like it could have been taken anytime in the last 30+ years with its yellowed vintage look. 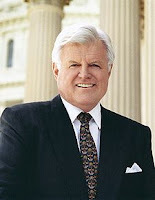 Last I want to say how sad I am to hear of Ted Kennedy's death today, an amazing politician. It seems so rare these days that we can say that. In honor of his life I hope we can get a universal health care plan passed that will provide everyone in this country with access to health insurance. This issue is very important to me having lost a dear friend to ovarian cancer several years ago, who did not have health insurance. Health insurance may not have saved her life, but it is possible that the cancer could have been caught earlier if she had insurance to pay for wellness check ups and she would not have had to go through hell dealing with bill collectors while she was trying so hard just to stay alive. So timely, Chris Matthews from MSNBC has a special on the Kennedy Brothers legacy that should be really interesting, tomorrow night (thurdsay) at 7pm. I know I haven’t been posting much lately, because I haven’t had a lot of art making going on. It has been a rough year in many ways, that I won’t go into now, but one of the issues I have been dealing with lately, probably affects a lot of others too, so I will talk about my present state of thyroid hell. I, along with a significant percentage of the population have Hashimotos disease or hypothyroidism. This is a chronic disorder that affects energy level, skin, joints, hair loss, metabolism among a list of things, basically my thyroid is losing its ability to produce enough hormone to keep things in balance. The treatment that has worked the best for me was using a natural thyroid hormone replacement called Armour thyroid, it is the only thing that has made me feel normal in every way. Well, earlier this year the company changed the formulation without telling anyone and people started to have serious problems, then they stopped producing all together with no notice. The only other company making natural thyroid, Nature-throid, was then flooded with orders and is now on back order. In the interim, my daughter Nina, who also has Hashimotos, and I have had to go on Synthroid. A synthetic hormone that only replaces the T4 hormone and not the T3 hormone, which together make you feel like a functioning human being. It has been awful to put it mildly. The first two weeks taking it, I had terrible joint pain and nausea and we have both had such low energy, it is hard to get much done. I feel like I did the year before I was diagnosed. Nina has been falling asleep on the couch every day and her eczema has gotten much worse with her eyelids swelling and peeling. It is so incredibly frustrating to not have any real alternatives until production on the natural formulations catch up, supposedly by the end of September. 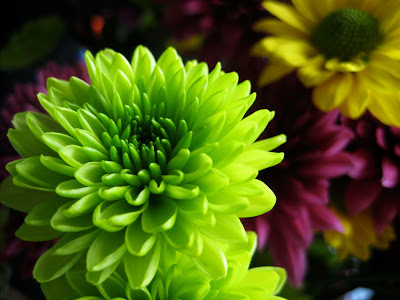 This week at the grocery I saw these bright and fun flowers that I couldn't resist, how can you say no to bright yellow daisies with green centers and limey green and red-violet mums. 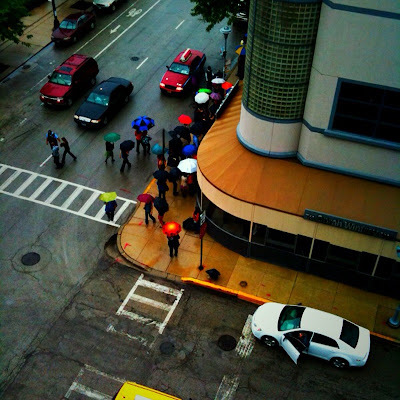 This is a great example of a split complimentary color scheme; red violet, yellow and green. Split compliments consist of a main color and the two colors on each side of its complimentary (opposite) color on the color wheel. 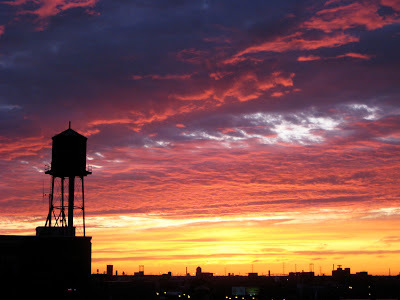 Last night I looked out the window and saw this gorgeous sunset, predominantly in yellow, red (pink) and blue, these three colors make up the primary color triad on the color wheel. 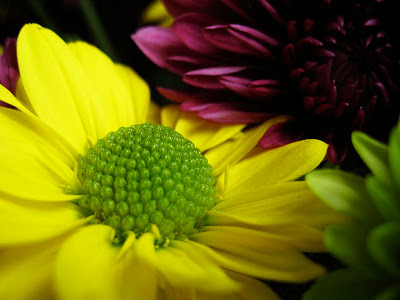 It is with these three colors in different combinations that create all the other colors. You can see examples of that here where the pink and blue have combined in the highest clouds are lovely purples and where the yellow and pink come together close to the horizon you see peachy and golden oranges. Understanding the basics allows for endless possibilities. If you are interested in learning more, join the next online color theory class. Innovations in Textiles is a biennial collaborative event in St. Louis, MO that investigates the state of contemporary textile arts. Over 20 nonprofit and private arts organizations join forces to present exhibitions related to fiber art created by national and international artists. 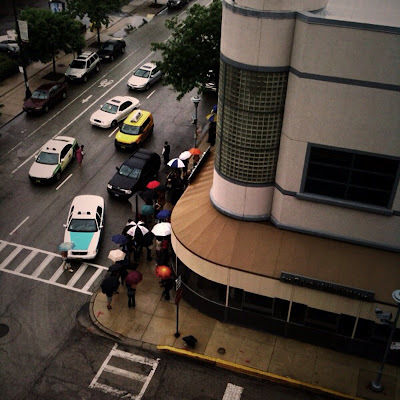 Activities include workshops, lectures, gallery tours and community programs. 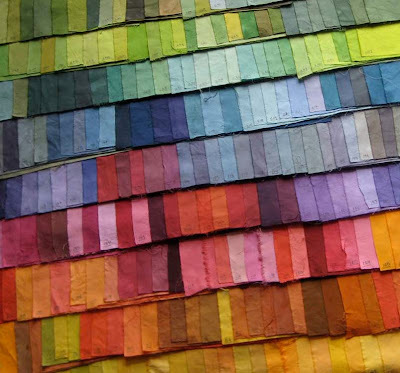 Innovations in Textiles serves to enlighten the community with a unique aesthetic perspective on fiber art featuring various materials and techniques. The broad range of programming mirrors the symposium's dedication to the investigation of innovative ideas. I have never been to St. Louis before, so this will be a new adventure. I will be teaching Mixed Media Painted Fabric and Tsukineko All Purpose Inks on Saturday and Sunday, Sept. 19th and 20th, these workshops are now open to public enrollment if you would like to join us. The next class begins September 8 and ends November 8th. If you would like more info or to join the class send me an email following the link on the class description page. "With a fresh approach and an A-list group of contributing artists, Creative Time and Space embraces the idea that making time and space is at the core of creativity. It is not just about managing your time or setting up a studio space, it is about your mindset and about making room in your life for your craft. Enjoy active sidebars alongside photos of the work and workspaces of the featured artists, as they speak with refreshing candor about how they carve out creative time and space in their own lives." I am thrilled and honored to have been chosen by Ricë to participate in this amazing book with an incredible list of artists who work in a variety of media. Ricë asked wonderful interview questions that really had me digging deep and thinking about how I work, live, make art, the choices I make and priorities I set in order to find the time and space to create. I really look forward to reading about how everyone else answered Ricë's questions. This is sure to be a great read for all of us who love creating. Be sure and click on the book above to see the preview, you might want to pre-order a copy now, it is sure to be another must have for the bookshelf from Ricë. 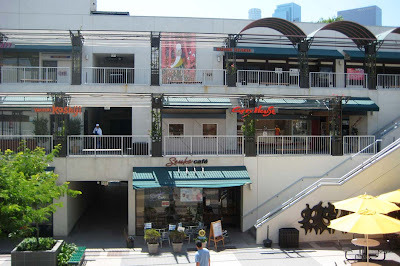 When ever we go to Los Angeles one thing we can not miss is a trip downtown to Little Tokyo, on a quest for paper, cool new pens and pencils and books. 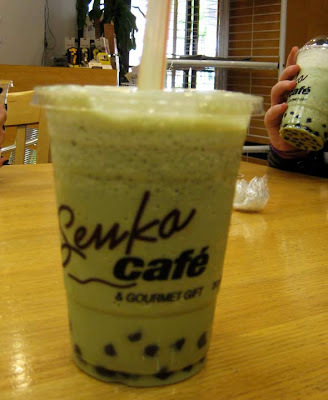 Our favorite drink is green tea Boba with soft sweet tapioca balls, many places refer to this drink as bubble tea, but in LA everyone calls it boba. In Chicago we have had a hard time finding boba that tastes as good as they make it in LA, usually our biggest complaint is the tapioca balls are a little hard and flavorless here. Nina has begun making it at home, so we had to make a stop in a grocery to stock up on green tea powder and a few bags of the large tapioca. 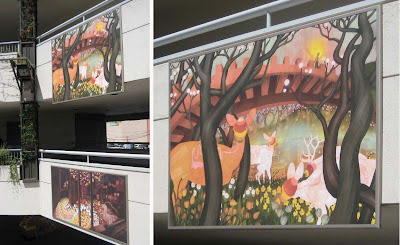 When we arrived at Weller Court I was pleasantly surprised to see these beautiful illustrations hanging on the walls of the courtyard. 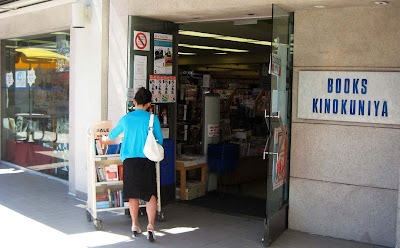 The store we like visiting the most is Kinokuniya, a large bookstore that has so much more than just wonderful books. The stationary department always has the coolest stuff! I treated myself to a new mechanical pencil that holds .3 mm lead! It draws with an incredibly fine line. One of the cool features of this pencil besides holding very thin lead is that you can adjust the top of the pencil to indicate what type of lead (2B, HB, H, 2 H) you have in the barrel. 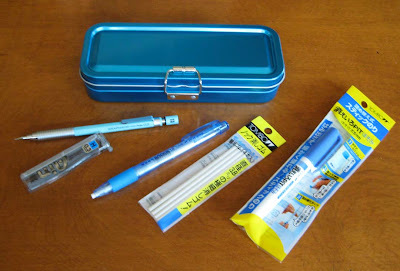 I also bought another eraser holder with spare white erasers. 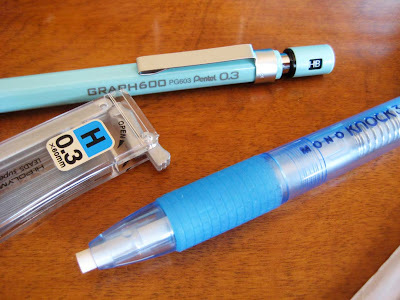 I love using one of these when I am drawing, the narrow diameter of the eraser helps you pinpoint and erase just the areas you want. The last package holds a glue pen. 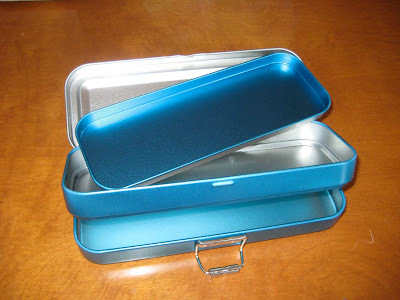 I love this turquoise anodized metal pencil case with three separate compartments to hold tools.